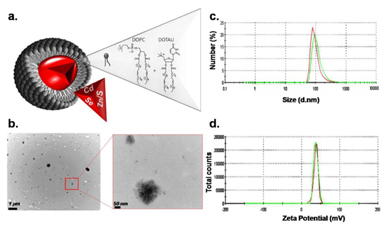 The in vivo uptake of functionalized nanoplatform, Quantum Dots (QD: CdSe/ZnS) encapsulated with nucleolipids, were studied in freshwater platyhelminths, Mesostoma lingua. Nanoplatform bioavailability, fate within flatworms and ultrastructural damages were investigated using small angle X-ray scattering investigations and both confocal and transmission electron microscopies. We report QD accumulation in cytoplasm and organelles (cilia, vesicles, endoplasmic reticulum, Golgi bodies, mitochondria and nucleus) of different cell types as function of time exposure (24 h to 96 h) and concentrations (from 0.25 to 1 000 µg.L-1). A relevant result is the transfer of QDs from adult tissues to offspring. In spite of the presence of an embryonic shell, transmission electronic microscopy observations evidence a failure of this natural barrier to protect embryos from QD internalization and raise the question of the long term consequences to the offsprings.